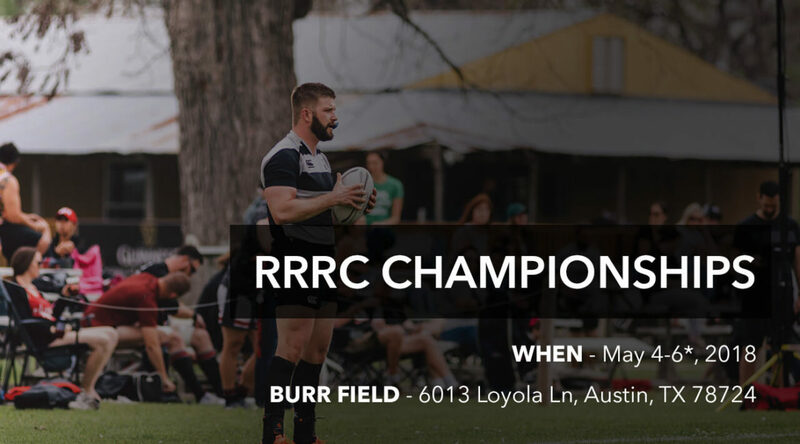 The RRRC Championships will be held May 4-6*, 2018 and will be hosted by the Austin Blacks at Burr Field [MAP]. Come join us for an unforgettable weekend where we will crown the RRRC Men’s D1, D2 and D3 Champions, as well as the RRRC Women’s D1 and D2 Champions. The TRU Hall of Fame 2017 Class will also be celebrated throughout the weekend at the fields and with a celebration banquet on Saturday evening. Go to the Hall of Fame page on the Texas Rugby Union website for all the details. *Men’s D1 ONLY will be Friday and Sunday. The other divisions will remain as a Saturday and Sunday competition. Note that matches on Friday night will be at the Round Rock Multipurpose Fields at Old Settlers Park [MAP]. All matches on field 1 will be live streamed on the TRU Youtube Channel. Matches on field 2 will be recorded & uploaded at a later date. All matches on field 1 will be streamed on the TRU Youtube Channel. A block of rooms has been reserved at the DoubleTree by Hilton Hotel Austin [6505 N Interstate 35, Austin, TX 78752 –MAP] for May 4 – May 6, 2018. This special room rate will be available until April 27th or until the group block is sold-out, whichever comes first. We do recommend booking ASAP as there are several other events in Austin that weekend (iHeart Festival among others) and hotels are already full. Once you’ve made your reservations and you wish to cancel, please do so 48 hours before arrival to avoid cancellation penalties. If you have questions about the RRRC or TRU Championships please contact Wendy Young, TRU Admin at admin@texasrugbyunion.com. If you have questions about the event location or other field logistics, please contact Bill Taute at bill.taute@gmail.com.